Dark Brown Vinyl Storage Ottoman with Four Trays by HomeSullivan at Indsight. MPN: 40468PU(3A). Hurry! Limited time offer. Offer valid only while supplies last. 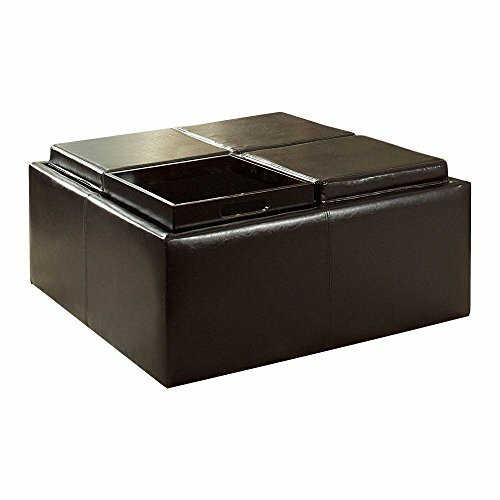 The faux leather storage ottoman can serve as a foot rest or extra seating. The top flips open to reveal four trays for convenience storage purposes. The faux leather storage ottoman can serve as a foot rest or extra seating. The top flips open to reveal four trays for convenience storage purposes. It features Asian hardwood construction. The dark brown vinyl upholstery highlights this modern style ottoman. If you have any questions about this product by HomeSullivan, contact us by completing and submitting the form below. If you are looking for a specif part number, please include it with your message.